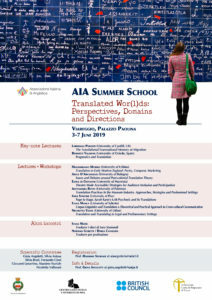 Following the success of the AIA Summer School last year, the AIA Board is pleased to announce its second edition, which will be held again in Viareggio, at Palazzo Paolina, from 3 to 7 June 2019. This year the School is dedicated to various aspects of translation theory and practice – from literary and specialist translation to the great contribution given to the field by corpora studies. Besides lectures held by distinguished Professors from both Italy and abroad, participants will have the opportunity to practice translation in various workshops under the supervision of eminent scholars as well as professional translators. By combining scientific expertise with first-hand experience of translation in the working world, the school aims at presenting translation as a thriving field for career opportunities within and outside academia. The Summer School is open to (in order of priority): PhD students (with admission priority), Doctors of Philosophy without a permanent position at University, research fellows (assegnisti), temporary researchers (RTD A and B), and school teachers. This year AIA will award a number of bursaries to PhD students without scholarship and Doctors of Philosophy without a permanent position at University, selected according to their CVs. Depending on the number of enrolments, AIA will provide either 4 scholarships covering the full early-bird fees of the school (see below) or 8 scholarships covering half of the early-bird fees. The winners will be announced in the AIA Newsletter, Facebook Page and website. 250 euros: PhD students without scholarship and Doctors of Philosophy without a permanent position at University. 350 euros: PhD students with scholarship, research fellows (assegnisti), temporary researchers – RTD A and B -, school teachers. At the end of the Summer School participants will obtain a Certificate of Attendance. The attendance of the whole course will grant participants 6 credits (CFU).